The New Jersey municipal courts are local courts that hear cases involving traffic infractions including, but not limited to, charges of speeding, careless driving, driving while intoxicated, or driving under the influence. Municipal courts also hear lower-level criminal cases involving the possession of relatively small quantities of illegal drug and simple assaults. Many New Jersey residents will have to appear in a municipal court at some point, and this will probably be their only encounter with the criminal justice system. Municipal court cases are frequently resolved in a single appearance with a negotiated guilty plea to a reduced charge, and payment of a fine and court costs. Sometimes, a case may not be resolved so easily, and a trial will be necessary. Municipal court trials are non-jury trials; the municipal court judge, working alone without a jury, will take the evidence (witness testimony and physical evidence), and then decide the case. These trials are generally conducted quickly. Because the trial court record is relatively concise, identifying viable issues for further review can require considerable skill and experience. The procedures for commencing a municipal appeal are also very different from those that are followed in appeals from decisions of the Superior Court. Under current New Jersey law, the appellant has 20 days to commence the appeal by filing the appropriate papers in the Superior Court of the county where the municipal court is located, and in the municipal court. Further, the Appellate Division of the New Jersey Superior Court does not hear the initial appeal from the decision of a municipal court judge. A criminal trial judge in the Superior Court in the county where the municipal court sits will hear the matter. Finally, even though it is generally referred to as a municipal "appeal", it really is an entirely new trial. The Superior Court judge will do more than just focus on discrete errors in the municipal court record. Instead, they will render a completely new decision based upon the entire municipal court record, which may or may not be in accord with the decision of the municipal court judge. As such, reviewing the municipal court record, developing an effective brief, and arguing the case, all require skills that differ considerably from those employed in a conventional appeal. The criminal defense firm of James S. Friedman, LLC, represents defendants in municipal appeals throughout the state of New Jersey. The firm brings all of its appellate experience to bear upon municipal appeals so that all viable issues are identified, properly briefed and presented to the Superior Court judge that will hear the matter. Experience has shown that many municipal appeals arise from a second or third conviction for driving while intoxicated. That is not surprising, since an adjudication of guilt in such a case can result in an extended suspension of a New Jersey Driver's license, as well as county jail time. Anyone living in New Jersey knows how difficult daily activities can be without access to a car. Driving privileges are worth protecting. 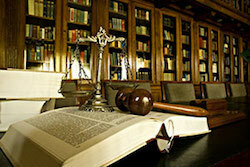 Defendants who lose that important right may be able to have it restored by means of an appeal. If you have had an adverse result in a New Jersey municipal court matter and want another judge to take a fresh look at your case, contact the criminal defense firm of James S. Friedman, LLC, online or call toll free at 800-361-6554 to learn more about municipal appeals.